Successfully Added 8 Inch LCD Touch Screen Monitor (Widescreen 16:9) to your Shopping Cart. 8 Inch LCD Touch Screen Monitor (Widescreen 16:9) for PC's and other electronic devices. Use your computer while in the car with this widescreen 8" touch screen with VGA that allows mouse cursor control with a stylus or your finger. The monitor also includes two AV inputs so you can integrate it with your car DVD player or rear view camera system. Now how COOL is that! In addition, you can also use the CVFQ-E13 as an extra monitor while working on your desk. 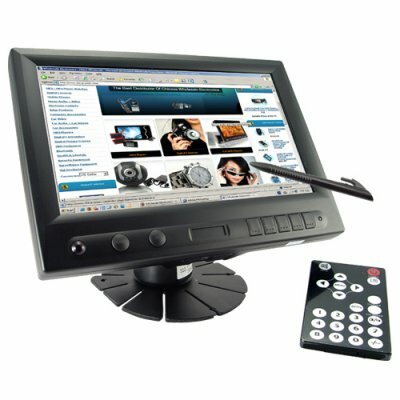 This widescreen LCD touch screen monitor will prove very useful in keeping an eye on surveillance video or your stocks while you are working on your computer. This amazing 16:9 LCD touch screen monitor is nothing short of technological innovation. This is the most affordable method to get touch screen technology function for your computer, rather than spend thousands of $$$$ on a touch screen integrated computer system, and best of all, it can be used pretty much anywhere! Be up to date with the next big thing in car entertainment and get it from Chinavasion at awesome wholesale prices for your personal/company use, resale market, online/physical store along with a 12 month warranty., and is available to you from the leader in direct wholesale electronics, Chinavasion. The perfect size LCD for use in your car or on your desk. Touch Screen LCD - control your Windows mouse with your finger! Use it as an extra LCD Monitor on your desktop. Is it easy to install this LCD touch screen in my car? Yes, you can place it anywhere you wish. It is provide with a mounting plate which has a foam rubber adhesive bottom so you can fix it on any flat surface. If you need to make use of the LCD touch screen monitor somewhere else, is can be easily detached from the base and taken out of the car. Is it easy to install at my work desk? Yes, it can be placed anywhere you wish. It is provide with a mounting stand which has a foam rubber adhesive bottom so you can fix it on any part of your desktop. By rotating the screen left or right you can make sure you always have it rotated to provide easy access to the information you want. Can this LCD touch screen monitor be used for film making purposes? Yes, this 8 inch LCD touch screen monitor is the perfect tool for location and studio filming. It provides widescreen viewing in a size that is easy to mount on top of cameras on hold in your hands. Can I use touch control on other electronic devices with the CVFQ-E13? No, the touch control can only be used on a computer, as for other electronic devices, you can use the CVFQ-E13 as an extra monitor.